We accumulated more than 20 years of surgical evolution. In these years we have gone through all the stages of learning that this entails. Nowadays we treat high level athletes, this has forced us to mature surgically in order to perfect the surgical techniques. In young patients with a high sports demands we are obliged not to fail to favor their professional activity. 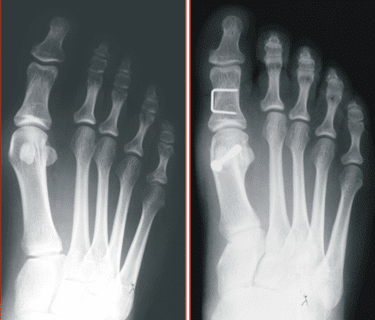 There are more than 100 surgical techniques described for the interventions of the 1st phalangeal metatarsal joint, known as the intervention of the bunions (hallux abductus valgus). At CLÍNICA MAYRAL foot center we are pioneers in the application of surgical goniometry known as osteogoniometer. It’s an intraoperative instrument that calculates mathematically the 1 metatarsophalangeal joint correction. The inventor from that instrument is my good friend Dr. Paolo Ronconi ,partner worker in the Foot Surgery Courses that CLÍNICA MAYRAL foot center organizes since 2000. CLÍNICA MAYRAL foot center is the first in Spain to use this instrument since 2003. Finally, we should mention that the success of foot surgery lies in understanding the biomechanics of the foot and adapting it to the patient’s needs. This allows us to correct the foot, providing it with the functionality necessary to improve walking and to eliminate most of the pain that this entails.